This is a departure from my Home Automation blog series, but this was my most recent addition to my system, so here is the write-up. I have my DVR set to record the show “I Want That” and we watch it during dinner for just some mindless entertainment and see what neat gadgets have trickled their way into the semi-mainstream media. So far we’ve come across a couple of winners, but most of what we’ve seen have been, of the “who want’s that?” department. So when we saw them cover DoorBot, I turned to my wife and said — “I want that THAT!” I did a small amount of research, a lot less than I’d normally do, I checked the compatibility of the device with my other devices — my home doorbell, and my android tablets and phones, read some press about it (Wired – named it on their best of CES list) and it was a go. I ordered it at the end of February (pre-ordered). The DoorBot arrived during one our recent cold snaps, so I did not start the install until a week later. No one wants to go fiddling around with wires and so forth during 10 degree weather. The installation process was tricky, but not overly complex. I had to cut out a DoorBot size space in my vinyl siding to make it flush with the house exterior and properly secure it with their proprietary security screw. (The security screw appears no more than a torx screw which can be easily adjusted with the proper torx bit). Installation — Please stop Ringing the Doorbell! After installing the doorbot, I proceed to get it to work with my many Android devices. The initial WiFi setup was simple enough, it connected to my WiFi hotspot and to the DoorBot servers. The simple stuff ended there. No matter what I tried, when I rang the doorbell, all my Android devices remained quite. After a few hours of that torture, I borrowed my sister’s iPhone, who was visiting for the weekend, and not but a few minutes later, I was able to answer and see, not hear, the person ringing my doorbell (me) using the iPhone 4S. Hmm, works with that, so it’s not a complete dud, but what about the Android 2.3+ compatibility touted on DoorBot’s website. I contacted DoorBot support, and after a few phone calls, the following Monday I started getting some traction and some response. After trying a new firmware, the DoorBot started to sometimes work on my wife’s Galaxy S4, and my Galaxy Note 12.2, but not on my Galaxy S4 (very strange) and not any of my other “supported” Android tablets. At this point, support kept insisting to try something else, but I am not in the business of fixing defective products which are supposed to be in their final working condition, so I proceeded to search for a replacement. 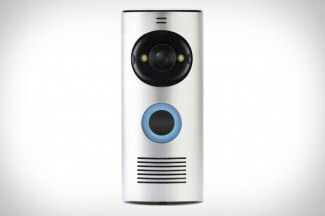 This device is much smaller, but touts similar (even more actually) features than DoorBot. 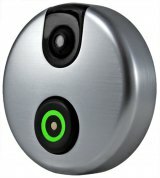 After getting an RMA# from DoorBot, I ordered a Skybell from Amazon. I’m glad I did, because the first unit arrived with poorly soldered wire leads which broke off an shorted the devices half way through installation process. The second device arrived with sufficient black goop (best I can describe it) on the connection point to the wire leads to the main board and allowed me to proceed with the installation. It took, no less than 2 hours and multiple re-configurations of my router to finally get Skybellt to connect to it. First “segregating” the 5Ghz band from the 2.4Ghz band, disabling my upstairs WiFi repeater, then disabling the N network on the 2.4Ghz band. Skybell indicates that their product is 2.4Ghz and B,G,N compatible — might be so, but setup did not work with N network enabled. After setup finished, I restored my WiFi configuration and Skybell continued to connect and operate properly. 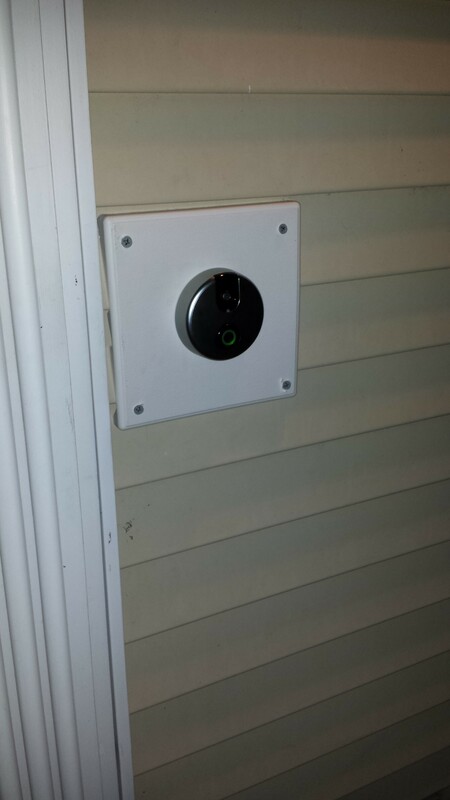 Since I had the DoorBot size hole in my vinyl siding, I had to fix/cover that with something, and since Skybell is much smaller — it had to be something which the skybell can be mounted to. I picked up a generic light mounting panel from HomeDepot, and after some modifications to make it contour to my siding profile, I was able to install it and the Skybell on to it. Of course I had to ring the doorbell about 30 times during the installation process causing my wife to go slightly mad upstairs. We are an all Android house. I have a couple of older iPod touches, but those are purely for testing code for work. So It’s critical that any device which relies on mobile work on Android, and work well. Skybell worked flawlessly on our Samsung Galaxy S4s (both mine and my wife’s, still can’t figure out why DoorBot worked on her’s and not mine). It also works very well on my Note 12.2. I have to update the Android software on my other tablets, but so far the Android experience is workable — not perfect, but works. I find IOT (internet of things) devices such as these two, have a lot of promise, but the execution leaves you wanting for someone’s execution — literally — you want to find the developer who wrote this and strangle them. I love home automation, and programming, and do not claim to write bug free code, but sometimes when something just plum doesn’t work — there is really no excuse for it. Some people are willing to grow with the growing pains of a product. I live with a pebble, and I see how that can be, but the version 1.0 of anything has to deliver on some basic functionality. It has to work. It should not require calls to support, emails which go un-answered for days, and replacements of poorly made hardware. It is frustrating, and if a bleeding edge geek like me find it so, the world of IOT will drown before it can learn to swim.